The Central Museum located at Indore displays some of the rare and elegant collection that deserves the status of being maintained, for the generations to see and learn from them. The main things that are on display at the museum are the Parmer Scriptures, different coins, armours and artifices. The history of the Central Museum at Indore dates back to the time of the Holka Dynasty when the Kings of the Holka Dynasty were persuaded to submit to the British, and so, a large part of the kingdom needed to be surrendered. This included their capital also, the present Cantonment. The armors of the Holkas, their arms and ammunitions have been kept with concern at the Museum in Indore. So, the Museum at Indore which is also known as the Central Museum has all the attractions that would make a classic collection, of choicest materials. 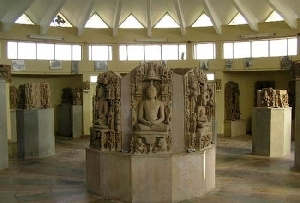 The Central Museum at Indore was established in the year 1929, and it is mainly a regional institution. It has a collection of various antiquities that have been gathered from the Malwa region of Madhya Pradesh. In those days, warfare was the chief judging factor for the nobles and kings, whoever was efficient in battles was considered as the most respectable person. It did not matter whether the person knew or not how to read and write. The Indore Museum has a multiple collection of the Palmer Scriptures. The Palmer scriptures were the ancient style of architecture that originated here. The stones of the Central Museum also depicted various shapes carved out of stones depicting emblematic figures. They are done with absolute care and dedication. Precision is conspicuous in them. Apart from all these there are also numerous coins and armors those are on display at the Museum.